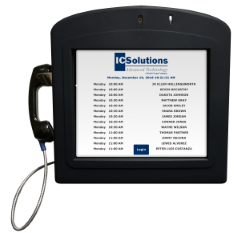 The Visitor™ Video Visitation System is available to Summit County friends and family members. Registration and scheduling is available at www.icsolutions.com! Summit County offers The Visitor™ video visitation system which allows friends, family members and professionals the control to schedule and conduct video visits at a time convenient for them and avoid wasting time waiting in long lines or traveling to the facility. Video visitation replaces traditional face to face visits on visitation telephones through a glass partition with visitation through video kiosks and are conducted with the inmate never having to leave their housing unit while the visitor can choose to visit onsite at the facility or offsite from anywhere.